I like to think that if I were “pageant quality” (you know, like Sarah Palin), I would have a mundane, yet mindbogglingly amazing and weird talent like this. My favorite part is where the audience claps for her holding up her leg. I’ve had some Schaefer Kathleen yarn kicking around in my stash for a while now. Picked up on sale at a not-so-LYS this summer, I had a very hard time settling on a project for it. The yarn is gorgeous and I am so in love with this colorway that I want to marry it. (No really. I knitted my Clapotis (a pre-ravelry/pre-blog project) in this colorway and I also have it in a hank of sock yarn. Love it.) So, with the Sweater of Rassilon on a time out right now, I pulled this yarn out of my stash and started poking around on Ravelry. Thank goodness for the miracle of Ravelry–someone finally posted a project in this yarn that wasn’t a scarf and only needed one hank of yarn. It’s snowing here today. It’s not the snowmageddon they were predicting a couple of days ago, but the schools are closed and we’re going to stay inside anyway. 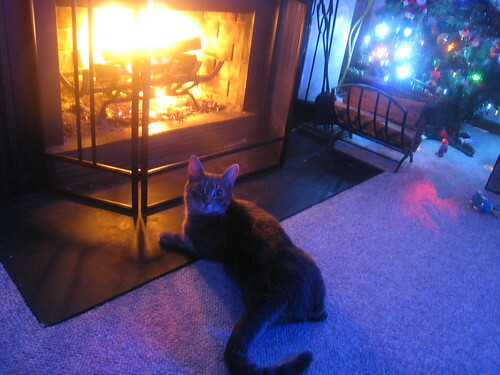 We like to have a big fire on days like this and Doozer’s favorite place to be is right in front of it. 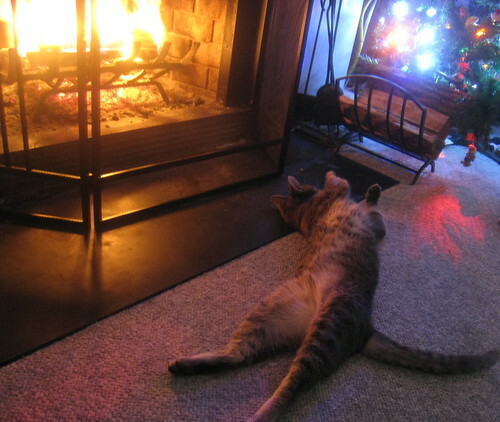 They say that cats were domesticated because they lacked a proper fear of fire. 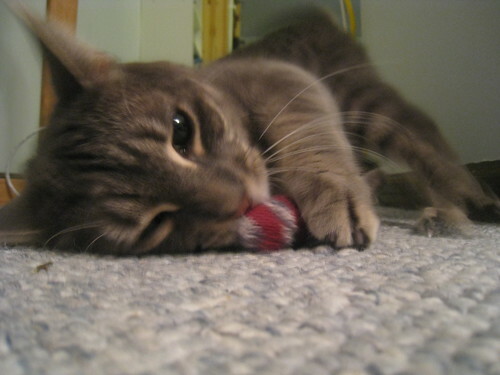 …and sometimes it knits you. Exhibit A: The Bird in Hand Mittens [ravelry]. It turns out I am not that much of a Vikings fan. 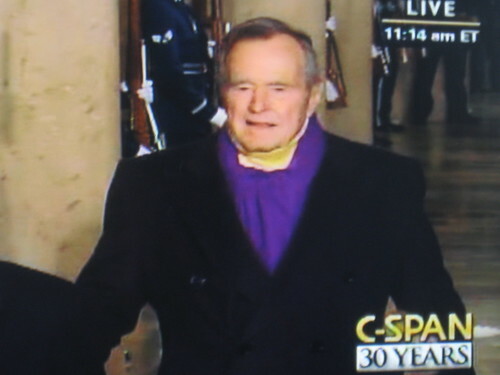 Also, remember this foppish fellow from inauguration day? Yeah. This project will be frogged in favor of a better less garish different color combination. I had an amazing and strange dream this morning, involving Captain Jack, Doctor Donna, and furniture shopping at Ikea. Perhaps I need to have my head examined? 1. I finished reading Water For Elephants. Wow, what a wonderful and deeply satisfying read. It’s also inspiring to see just how fantastic a NaNoWriMo novel can be. 2. 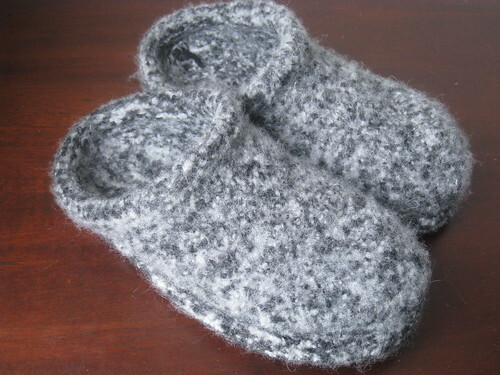 I cast on and completed a pair of felted clogs (a ravelry link). They are are so awesome, everyone should make a pair. 2 pairs, even. 3. 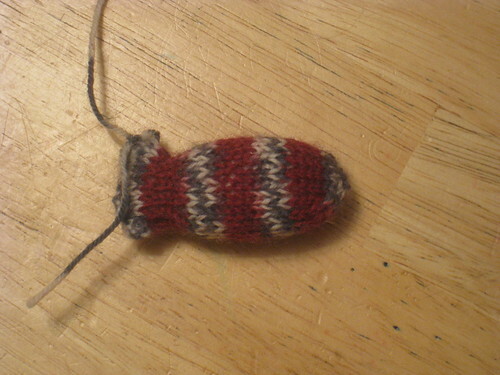 I cast on the Bird in Hand mittens and they are coming along quite nicely. 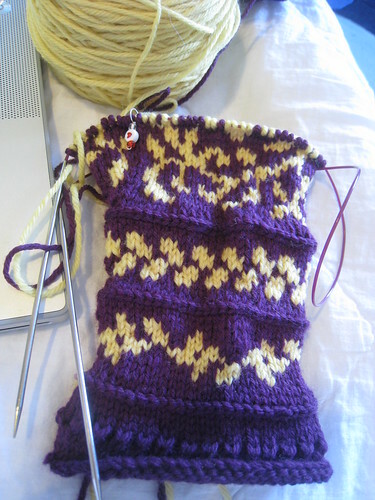 In fact, stranded knitting may very well be my new favorite thing. Pictures soon. 4. I have a new asthma doctor and a new asthma medication. I hope to be breathing better soon. 5. My tendinitis has flared up again. 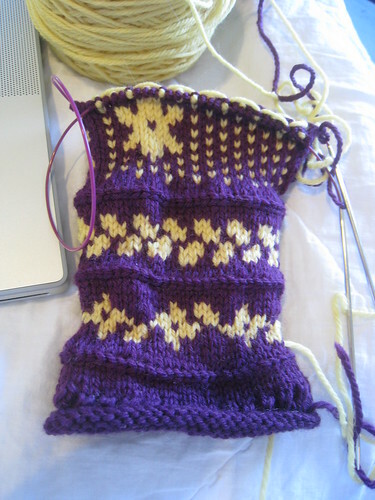 I think it might have something to do with my trying to knit faster, which I remember trying to do last time, too. My new mantra: I do not need to hold the world record. 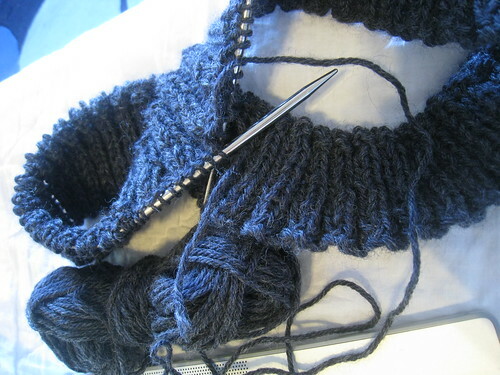 I can knit at the speed which is comfortable for my body. It’s OK if it takes more than a day to complete a pair of socks. I do not need to hold the world record. Om. 6. We have a new president. I tried to capture the moment yesterday while watching the ceremony on the teevee machine and knitting, only to fail miserably at getting any good photos. I was moved to tears by his speech, especially the part where he referred to the sacrifices of our ancestors and reminded us that those sacrifices were made for us. It was amazing. 7. I have been sitting so still in this room for so long that the automatic lights have switched off. 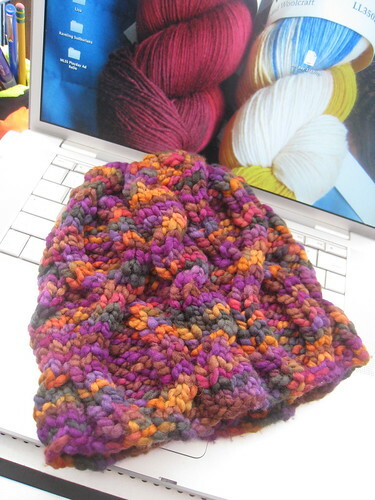 It is knitted on two needles using the magic loop method. Don’t bother weaving in your ends. 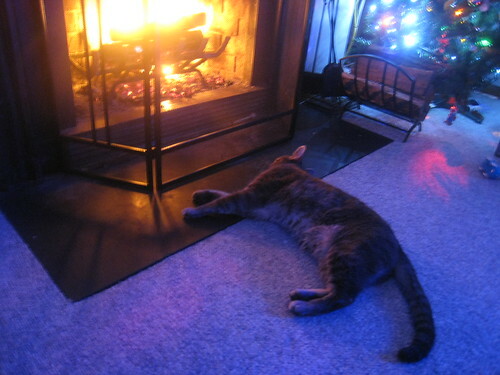 The cat won’t care.